This fruit stand is by Megahouse miniatures. Megahouse makes excellent miniatures like Rement except their miniature scale varies at times. 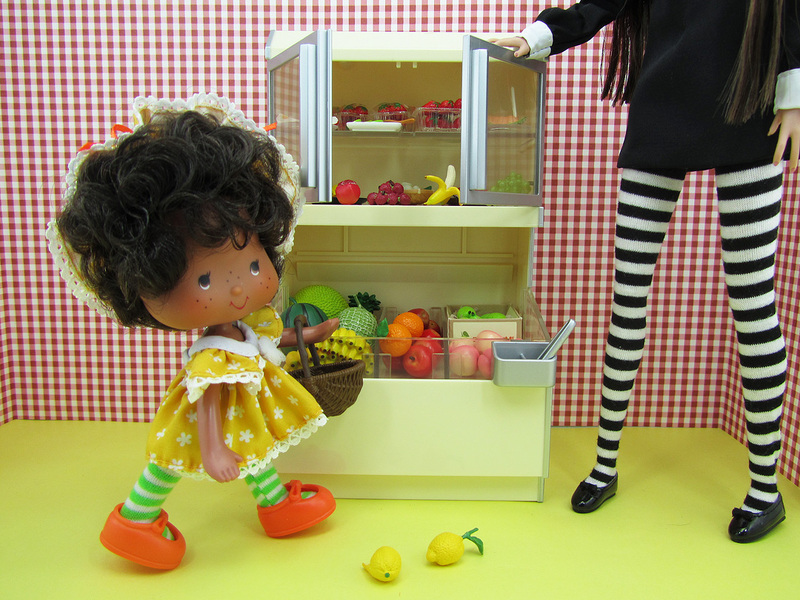 This one, for example, is a little small even for a Licca-chan doll and she's only 9" tall. 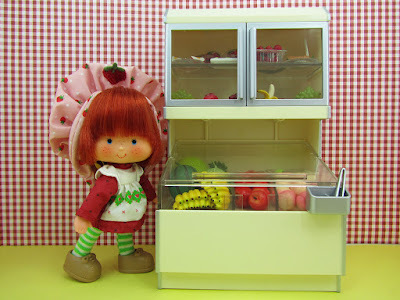 Luckily my Strawberry Shortcake dolls, who are 5.5" in height, seem to be nicely scaled to it. 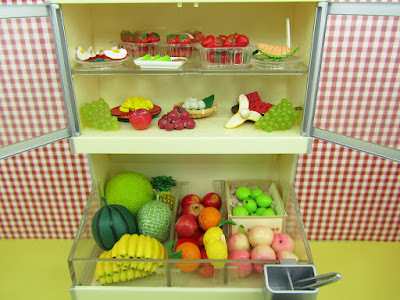 The fruits inside are a mixture of Orcara and Rement miniatures. 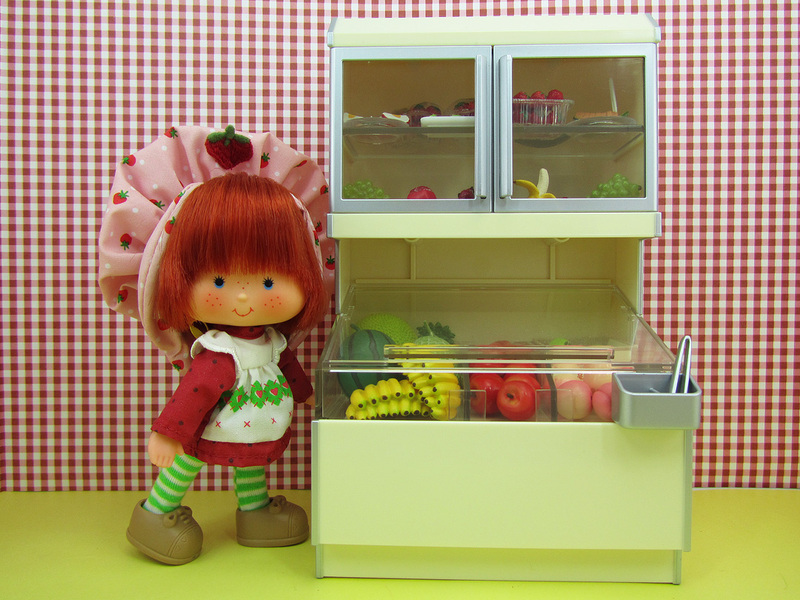 Once again, I can't stress enough how much I love these miniature displays for my food minis. Not only are the fruits displayed beautifully, but they are more organized. Orange Blossom: "Oh my, what long legs you have!" 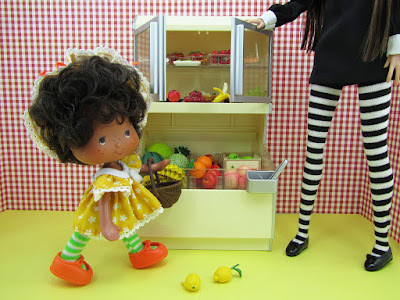 Here's Orange Blossom with a Poppy Parker doll...just to give you an idea of scale. Plus I thought this picture was funny! And lastly, the Strawberry Shortcake dolls shopping together for their favorite fruits...except for Raspberry Tart who insisted on carrying a basket full of those Lalaloopsy pets instead. This is super-fun (as are all Miniature Mondays)! I especially love all the Asian fruits not often seen where I live--cool! OMG I can't get over the cute! 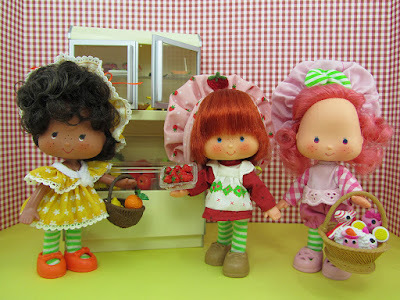 I used to love Strawberry Shortcake when I was a kid!